In 2012, the total sales of solar collectors were approximately 16 000 sq metres. Out of these, about 13 000 sq metres were in one single large-scale plant, as described below. For the smaller systems, vacuum tube collectors represented roughly 25% of this volume (approximately 800 sq metres) and flat plate collectors the rest (approximately 2450 sq metres). In addition, there was a sale of about 2000 sq metres air collectors during the year. The market for solar thermal systems seems to be relatively constant. Norway’s first large scale solar thermal facility was commissioned in 2012. The plant consists of 13 000 sqm solar collector panels (flat plate), and is connected to the district heating system at Lillestroem, 30 minutes east of Oslo. Solar combined systems (DHW and space heating) in domestic family houses constitute nearly 60% of the total market. A single large-scale solar district heating system stands for roughly another 30% of Norway's solar thermal applications. Hydropower has been the main source of electricity generation in Norway, meeting roughly more than 95% of the demand. Electricity is also widely used for heating purposes, both space heating and DHW. A relatively low electricity price level is the main explanation for why the market for solar thermal systems is relatively limited, although increased market interest and activity is noted since early 2013. An important competitor in the small segment, especially for single family houses, are heat pumps (mainly air/air) and in some instances small biomass fueled systems. Enova SF, a public agency established to improve energy system efficiency and increase renewable energy production, has offered households financial support for investments in solar thermal energy since 2008. Aventa AS has a long experience using polymer materials in solar thermal applications. Through a collaboration with Chevron Phillips Chemicals and Kaysersberg Plastics, Aventa has developed manufacturing technology for solar collectors crafted in advanced plastic materials. During 2012, Aventa AS completed it’s new facility for the production of solar collectors. The facility automatizes an important part of the solar collector production; namely joining end-caps and absorbers (the solar collector’s active core). This is done by using an infrared welding method, which creates a high and stabile quality. The Aventa facility has an annual design capacity of approximately 40 000 sqm solar collector area. 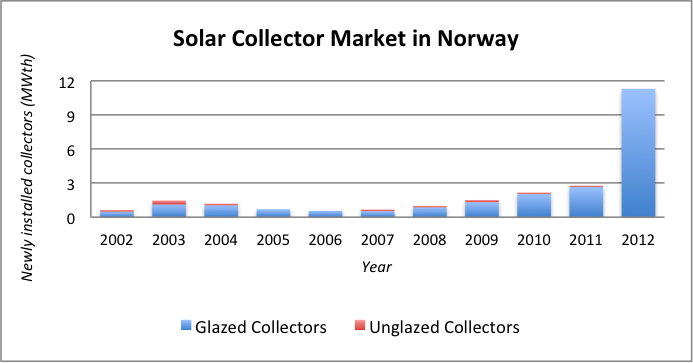 Norsk Solfangerproduksjon AS (ASV Solar) is producing solar collectors from aluminium. The solar collectors is not pressurised, and drains the water in the solar collector circuit every time the pump stops. All in all, there are about 25 suppliers of solar thermal systems in Norway, and a large portion of the installations are imported. Both the Norwegian Government, through building codes and regulation, as well as actors in the building sector, focus largely on low-energy buildings and nearly zero-energy buildings. Energy efficiency measures are the major solution for such building projects. There is an increasing focus on the use of solar energy solutions in building projects - both solar heating and solar electricity. Activity in the building/construction sector has been relatively high in the recent years. Environmental aspects are becoming an increasingly important market parameter for actors in the Norwegian building and construction sector. There are some signs showing that solar energy, including PV, is used to strengthen the environmental performance of buildings. The environmental assessment method for buildings, BREEAM (Building Research Establishment‘s Environmental Assessment Method), is a driving force behind solar energy solutions in buildings. Energy and environmental efficiency seem to grow as competitive parameters in the real estate market. There is no dedicated R&D programme targeted towards solar thermal energy. Solar energy is, however, a topic in a number of activities tied to building research. In 2010, the Research Council of Norway established eleven centres for environmental friendly energy research. Centre for Zero Emission Building (www.zeb.no), has energy supply systems and services as one of its main topics. The Centre is hosted by The Norwegian University of Science and Technology (NTNU), but resources and activities are shared between NTNU and SINTEF, the largest independent research organisation in Scandinavia. The Centre leadership is thus shared between the two organizations. The Research Council also have a programme called ENERGIX. The ENERGIX-programme provides funding for research on renewable energy, efficient use of energy, energy systems and energy policy (www.forskningsradet.no/energix). Norway has goals to increase renewable energy production, energy efficiency and reduction of greenhouse gas emissions. For instance, renewable power production is targeted to increase by 13.2 TWh/year by 2020. Revised energy regulations for new buildings are being developed (TEK 2015). Incentive programs are mostly technology neutral. Consequently, there is no particular target for solar energy. Through the national building codes, new and refurbished buildings are required to have a certain heating capacity based on renewable energy aside from (hydro) electricity. This means in practice some solutions based on biomass or heat pumps. But in some cases solar energy is utilized. There is increased interest in solutions where heat pumps and solar thermal capacity are linked to make use of seasonal heat storage. No particular media sources are identified.